Gear up and get ready for Island Games! Special limited edition Island Games merchandise in now available in There Auctions for purchase. All proceeds go to support Island Games planning and events. Island Games competitive events run May 14th through the 22nd. View all of the Island Games merchandise in Auctions. Best of luck to all of the teams! Do you want to play a game? Six randomly chosen teams will go head to head in a ten day friendly competition in the virtual world There.com. Island Games run May 14th through May 22nd. Sign up for the Island Games Invite List if you would like to participate. Once you are a member of the group, you will receive an invite to the team you’ve been assigned to. In order to play, you must sign up for the Invite List by May 7th. The deadline to accept your invitation to the team group is May 10th. Click on IslandGames_Avie’s profile for more information. To participate in the Island Games events, you must be a Basic or Premium Member. Join your fellow Thereians for a fantastic new competitive event in There! Five Island teams will go head to head to score points to be crowned the winner of Island Games. To get started to you need to be on an Island team! Register to be randomly selected to be added to team Ootay, Tyr, Caldera, Saja or Comet. The deadline to register is August 9th at noon Eastern time. If you missed the deadline, click here for more details on how you can still participate in Island Games. 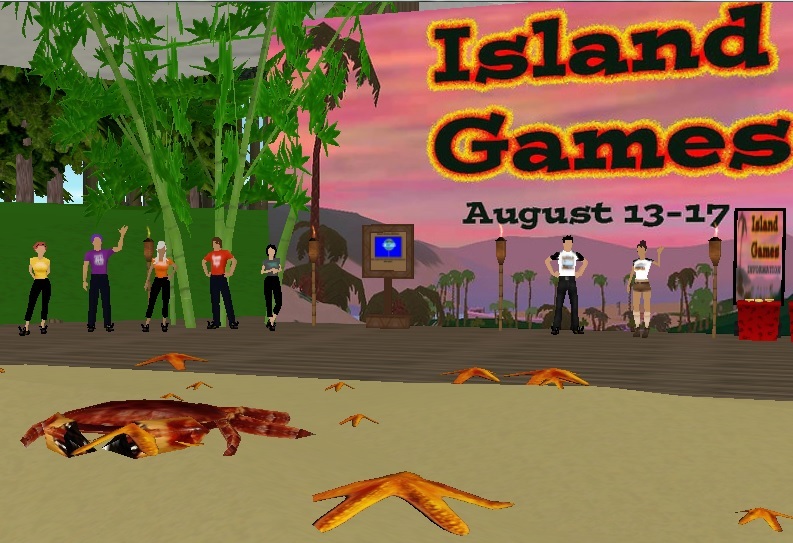 Sign up for the invite group and participate in Island Games Events starting August 13th and running through August 17th. Keep track of the score, events and other team members at the official Island Games website. Help support this great event by purchasing a hand held souvenir of the Island Game events!